Following the successful first International Ocean Colour Science (IOCS) meeting, the IOCCG will convene a second IOCS meeting in 2015, in partnership with, and thanks to the sponsorship of NASA and NOAA. We also thank EUMETSAT for their generous support. The IOCS-2015 meeting will take place from 16-18 June 2015 in San Francisco, USA. The primary focus of these biennial IOCS meetings is to build and strengthen the international ocean colour community by providing a forum to collectively address common issues and goals. This is the beginning of a new era for ocean colour radiometry with many space agencies planning to launch more complex and highly sophisticated ocean-colour sensors, with potential for many new applications. The overarching theme of the second IOCS meeting is Applications of Ocean Colour from Climate to Water Quality. The program will include talks by space agency representatives on the status of existing and planned missions, a number of breakout sessions, panel discussions, talks by invited keynote speakers, and comprehensive poster sessions to review the progress of ocean colour research. The meeting will also encompass and include the annual NASA Ocean Color Research Team meeting (OCRT). iocs.ioccg.org/breakout-sessions/. The deadline for session proposals is 31 December 2014. A number of IOCCG related workshops took place at the recent Ocean Optics conference in Portland, ME (25-31 October, 2014). Two of these were follow-up workshops from splinter sessions at the first IOCS meeting. The workshop on Phytoplankton Composition from Space (chaired by Astrid Bracher, Nick Hardman-Mountford and Taka Hirata) aimed to address the quality of satellite phytoplankton functional type (PFT) products and to develop a roadmap for the operational provision of satellite PFT products. Another workshop on Ocean Optics Protocols (chaired by Steve Ackleson) aimed to establish working groups for various parameters (beam attenuation, backscatter, subsurface and above-water radiometry), to lead updating activities for protocols measuring selected in situ and above water optical properties. Lastly, the IOCCG working group on Atmospheric Correction over Optically-Complex Waters (chaired by Cédric Jamet) met to pursue their goals. Reports from these workshops will be available shortly. In addition, the IOCCG Executive Committee met on this occasion to address many important issues that had emerged since the last Committee meeting, including plans for the next IOCS meeting (particularly with reference to themes for parallel breakout sessions and keynote speakers), distribution of Sentinel-3 data, building the operational component of the OCR-Virtual Constellation, and new reports in the IOCCG Report Series. All told, it was a very productive meeting over a short space of time. Trevor Platt (founding chairman of IOCCG) was awarded a Jawaharlal Nehru Science Fellowship from India. 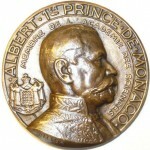 This is a new fellowship, which is awarded to scientists of outstanding distinction. Under the fellowship, Dr. Platt will spend 12 months (spread over the next 3 years) conducting research in India. Shubha Sathyendranath (past IOCCG Executive member) recently received the Grande Médaille Albert 1er de Monaco, for “the quality of her work in the field of satellite remote sensing and ocean colour”, an honour bestowed upon a world-class scientist in the field of oceanography whose work has contributed decisively to the development of their particular field. Another past IOCCG member, Ronald Zaneveld, received recognition in the form of a special edition of the journal Methods in Oceanography (Volume 7, Pages 1-124), which was dedicated to “Advances in Ocean Optical Observing”, in honor of Dr. Zaneveld’s work over the past 50 years. The special issue highlights his scientific contributions spanning theory, instrument design, field observations, and education and also includes emerging approaches to measuring and interpreting in situ inherent optical properties (IOPs). Congratulations to all on behalf of the IOCCG Committee. The Center for Satellite Applications and Research (STAR) at NOAA is staging for dedicated research cruises in support of JPSS – VIIRS validation and algorithm development. The first cruise will be 11-21 November 2014 aboard the NOAA Ship Nancy Foster out of Charleston, South Carolina, US. An international and interagency team has been assembled, including NOAA, NASA, NRL, NIST, JRC and several US universities. A suite of above and below water optical properties will be observed. Some properties will be measured with multiple instrument types. Our aim is to observe and measure inherent and apparent optical properties of water masses for three primary objectives: 1) JPSS VIIRS ocean color satellite validation; 2) Inter-calibration inter-comparison of validation techniques and measurements, and 3) optical characterization of ocean variability (i.e., coastal, nearshore, cross-shelf, eddies, fronts, filaments, blue water). Near-real time VIIRS satellite data products (ocean color and SST) will support decision-making for on-the-fly sampling strategies. The next cruise is being planned for October 2015, also aboard the Foster. NetCOLOR (Network on Coastal, Oceans and Lakes Optical Remote sensing) is a network of Canadian experts and end-users in the field of satellite water colour remote sensing. The group is funded by the Canadian Space Agency (CSA) and was established in 2014 to develop and coordinate a Canadian strategy for research, training and dissemination of water colour products. The first meeting of the steering committee, chaired by Marcel Babin, was held at Université Laval, Quebec City (11-12 September, 2014). The three key science sectors identified by the steering committee are 1) Use of water colour remote sensing to monitor water quality in lakes, rivers and coastal environments, 2) Monitoring bio-optical properties in the Arctic Ocean and 3) Use of water colour remote sensing to study biogeochemical cycles on various scales (local to global). Over its 3-year mandate the group will organise a national science meeting (Fall 2015), develop a strategy to ensure that in situ water colour data are archived and readily available to the research community, develop a NetCOLOR website and publish a report proposing a national strategy for research, training and dissemination of water colour products in Canada. A POGO Regional Training course on phytoplankton bio-optical variability will be offered at the Faculty of Marine Science, University of Baja California, Ensenada, Mexico, from 19 January to 6 February, 2015. The major theme of the course will be the application of measurements of bio-optical variables (phytoplankton pigments, inherent and apparent optical properties) to both the remote sensing of ocean colour and to the study of biogeochemical variability in the coastal zone. The course is part of a training program promoted by Nippon Foundation-POGO Centre of Excellence. For the full announcement please visit ocean-partners.org. In September 2014, ESA released the first version of three new open source toolboxes for the scientific exploitation of the Sentinel-1, -2, -3 missions. All three toolboxes are based on an evolution of the BEAM development platform. The Sentinel-3 Toolbox consists of a rich set of visualisation, analysis and processing tools for the exploitation of OLCI and SLSTR data from the upcoming Sentinel-3 mission. As a multi-mission remote sensing toolbox, it also supports the ESA missions Envisat (MERIS & AATSR), ERS (ATSR), SMOS as well as third party data from MODIS (Aqua and Terra), Landsat (TM), ALOS (AVNIR & PRISM) and others. The various tools can be run from an intuitive desktop application or via a command-line interface. A rich application programming interface allows for development of plugins using Java or Python. The SeaDAS development team recently announced the release of SeaDAS 7.1, which is built atop a slightly modified BEAM 5.0 version. SeaDAS 7.1 has a new user interface with a simpler and more attractive layout which makes finding and using tools easier. It also includes new tools, such as bathymetry and mask tool and contour operator tool. In addition to new features, it includes bug fixes and feature enhancements. The science processing code has undergone major changes for the 2014 multi-mission ocean color data reprocessing, many of which are related to the format change from HDF4 to netCDF4 (see oceancolor.gsfc.nasa.gov/DOCS/FormatChange.html). For full details see the SeaDAS 7.1 – Release Notes. The NASA Ocean Biology Processing Group recently announced that VIIRS ocean colour products have been reprocessed to version 2014.0, and the new products are now available through the NASA Ocean Color Web portal. General details on the reprocessing changes are available at oceancolor.gsfc.nasa.gov/cms/reprocessing/OCReproc20140.html. This is a major change to the VIIRS ocean colour products quality, as well as the product data formats, including transition to netCDF4. Many new publications have been added to the IOCCG Recent References list including a paper by Qi et al. (2014) who proposed a new approach to quantify phycocyanin pigment concentration (PC) from cyanobacterial blooms. Most of the past approaches to estimating PC focused on field measured reflectance data, which may suffer from atmospheric correction uncertainties and other perturbations when applied to satellite measurements. The authors took these perturbations into consideration for algorithm design, and proposed a 3-band subtraction using MERIS Rayleigh-corrected reflectance at 560, 620, and 665 nm, which was tolerant to perturbations from aerosols, sun glint, thin clouds, and extreme turbidity. MERIS RGB and PC images in two consecutive days show the stable performance of the new algorithm under different turbidity conditions. 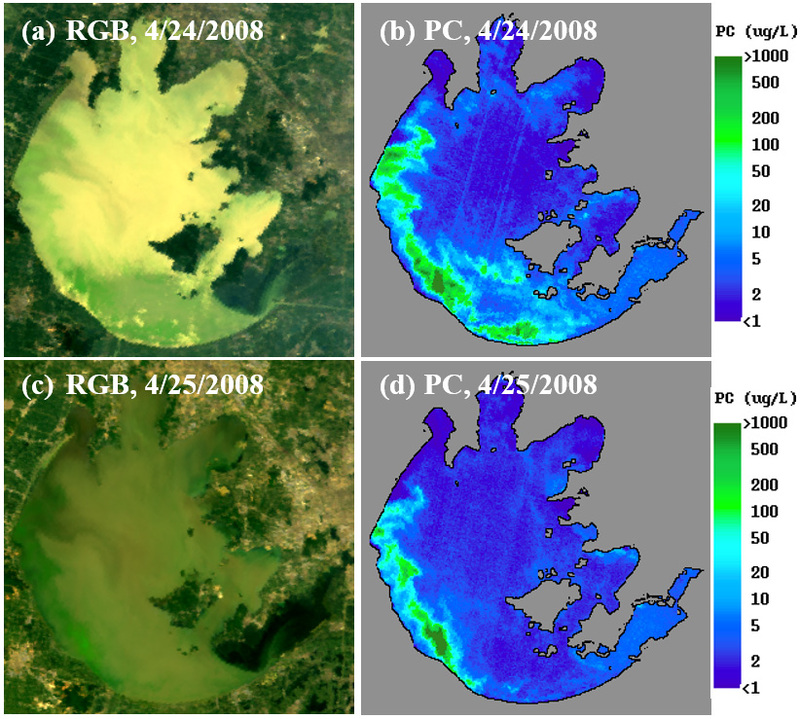 In another paper dealing with the routine monitoring of cyanobacteria and eutrophication in inland and near-coastal waters, Matthews and Odermatt (2015) developed an improved maximum peak height (MPH) algorithm, which was more stable than the fluorescence line height (FLH) and maximum chlorophyll index (MCI) values, and has been released as a plug-in for the Basic ENVISAT A(ATSR) and MERIS (BEAM) processing toolbox. Gregg et al. (2014) document decadal trends in global pelagic ocean chlorophyll for the period 1998 – 2012 by integrating three diverse methodologies to provide a consistent and complete global representation, free of sampling biases. The results indicated no significant trend in global pelagic ocean chlorophyll over the 15 year data record. However, all of the Northern Hemisphere basins, as well as the Equatorial Indian basin, exhibited significant declines in chlorophyll. 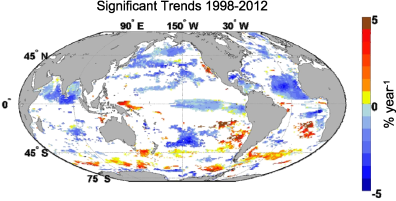 Trend maps were consistent with previous efforts suggesting the present effort provides a path forward to quantifying global ocean trends using multiple satellite missions. Map showing specific locations where trends in annual median Chlorophyll were observed (red = positive, blue =negative, white = no significant trend). Dogliotti et al. (2014) showed that a single-band semi-analytical algorithm using 645 nm and 859 nm bands and a switching scheme can be used to retrieve turbidity (T) from water reflectance in very different regions, and is almost insensitive to the sediment type. A good performance of the algorithm was found when applied to in situ measurements from diverse environments. Regional algorithms to retrieve suspended particulate matter (SPM) concentration from reflectance can be designed by combining this global algorithm to retrieve T from water reflectance, with a regional relationship to convert T to SPM. Chami et al. (2014), developed an innovative instrument dedicated to multispectral measurements of the volume scattering function and degree of polarization of hydrosols, called POLVSM. The originality of the POLVSM concept relies on its ability to measure the Mueller scattering matrix for a wide range of scattering angles (1° to 179°). The analysis of measurements performed under controlled conditions suggests that a sophisticated modelling of the heterogeneous internal structure of living cells, or at least, the use of layered sphere models, is needed to correctly predict the directional and polarized effects of phytoplankton on the oceanic radiation. Moore et al. (2014) detail the use of optical water type classification frameworks for selecting and blending retrievals from bio-optical algorithms in lakes and coastal waters. They found that when a blending approach is used, based on an optical water type classification, the overall RMS error was reduced, compared to use of a single algorithm. Brezonik et al. (2014) provide a comprehensive analysis of the factors that affect the reliability and interpretation of measurement of CDOM by remote sensing for optically-complex inland waters. Lastly, Robertson-Lain et al. (2014) show new methods of coupling algal population and radiative transfer models to improve optical modelling in eutrophic waters, and Evers-King et al. (2014) use the same modelling platforms to examine the sensitivity in reflectance attributed to phytoplankton cell size from a forward and inverse perspective. Their results suggest that the utility of assemblage related signals in spectral reflectance is highly sensitive to algal biomass, the presence of other absorbing and scattering constituents and the resultant constituent-specific inherent optical property budget. Several new employment positions have been posted on the IOCCG website including Post-Doctoral positions in Perth (Western Australia), Bigelow Laboratory for Ocean Sciences (USA), and University of Stirling (UK) as well as PhD positions at the Alfred Wegener Institute for Polar and Marine Research (AWI, Germany), Stockholm University (Sweden) and University Oldenburg (Germany). For further details on these and other positions see our employment page.